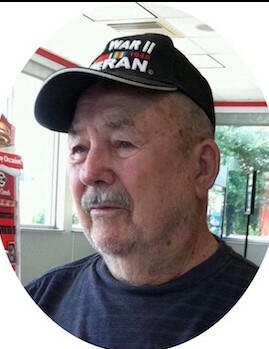 William G. “Bill” Rogers, 95, a resident of Gainesville, Florida and formerly of Dahlgren, Illinois, passed away Tuesday, March 19, 2019 in Gainesville, FL. He was born July 28, 1923 in Carmi, IL, the son of Charles D. and Pearl (Grigg) Rogers. Bill was a U.S. Army Air Corps veteran having served during World War ll where he received one Silver Star and four Bronze Stars for his actions during battles in the European theatre. After his military service he worked as an elevator mechanic and lathe operator for the Ford Motor Company in Sterling Heights, Michigan. Bill was an active member of American Legion Post 106 and VFW Post 1146 as well as a member of the Dahlgren Baptist Church. Bill married Maxine I. Arft on October 20, 1945 and she preceded him in death. Bill is survived by two daughters and one adopted daughter: Deanna L. McLain of Royal Oak, MI, Nancy (Jim) Frank of Gainesville, FL and Vincenza Dunn of Port Huron, MI; eight grandchildren: Deborah Heaton, William Gipperich, Kristina Lewis, Douglas McLain, Daniel McLain, James Frank, Brian Frank and Stephanie Cormier; seventeen great grandchildren: Cory Heaton, Kaitlyn Heaton, Michael Heaton, Emma, Stephanie Lewis, Sarah Lewis, Kimberly Lewis, Ryan Lewis, Luke McLain, Mia McLain, Anna Spillers, John Spillers, Jordan Frank, Lillith Frank, Anthony Cormier, Derrick Cormier and Kortney Frank; and five great-great grandchildren: Milayah Bessent, Khaliyl Legree, Aiden Cormier, Aaron Cormier and Adam Cormier. Two step grandchildren also survive. He was preceded in death by his parents, wife and one daughter, Sandra Mort. Funeral services will be held Thursday, April 4, 2019 at 11:00 a.m. at the Gholson Funeral Home in Dahlgren with Rev. Brad Sloan officiating. Visitation will Thursday, April 4 from 10:00 a.m. until the time of service at 11:00 a.m. at the Gholson Funeral Home in Dahlgren. He will be laid to rest at the IOOF Cemetery in Dahlgren with Graveside Military Rites performed by American Legion Post 106 and a Military Honors Team.